Perhaps none of the Wayne Estate house designs was more popular than that of House ”D” as shown above. Such houses appear with great frequency on the south side of St. Davids and Wayne, particularly on Lancaster, Midland and Windermere avenues. Many may have seen interior changes, but few, if any, now look any different on the exterior than they did when they were built. They do have a very pleasantly symmetrical appearance, and in this particular sketch, a home-like touch has been added by the circular seat around the trunk of the large tree at the left and by the rope swing. Although the customary flowery description of the interior is lacking, architect’s plans show that it contained a parlor, 24 x 14 feet; a reception room 18 x 13 feet and a dining room of identically the same size. Across the second floor front were three square bedrooms, the largest of which was 16 x 13 feet. Another bedroom at the back was of the same dimension and across the hall from it was a slightly smaller one. Although no third floor plans are given, presumably there were at least two bedrooms and storage space there. House “E” embodies “a plan that is a unique model of cosiness”, according to the brochure, which goes on to say that “the rooms are fair sized and well arranged for light and comfort. A shady porch all along one side with a return to the front entrance… This house will suit any ordinary family.” Downstairs floor plans show that this house differed decidedly from several of the others in that the three main rooms were all on one side, rather than with the parlor and reception room across the front. The reception room was directly back of the parlor, connecting with it through a wide archway, and back of the reception room was the dining room. On the second floor were the usual five bedrooms and one bath. Originally there seems to have been no variation in this number of second floor bedrooms. As time went on the number of bedrooms tended to decrease to four, as it became necessary to change a bedroom into a second bathroom, now considered practically an essential in houses the size of the Wayne Estate ones. On the third floor, either the second bedroom or store room space has often been utilized for another bathroom. In the three weeks during which the pictures of the Wayne Estate houses have appeared in this column your columnist has attended no gathering, social or otherwise, at which some mention has not been made by one, and usually several people concerning their enjoyment of pictures that have already appeared and of their pleasurable anticipation of those that are still to come. Except for newcomers, the prevailing note is mostly one of nostalgia. Many who are now in apartments or one story ranch type houses, watched their young families grow up in the rambling comfort of a Wayne Estate house. And it is certainly in just such a nostalgic mood that your columnist studies the first picture shown in today’s column. 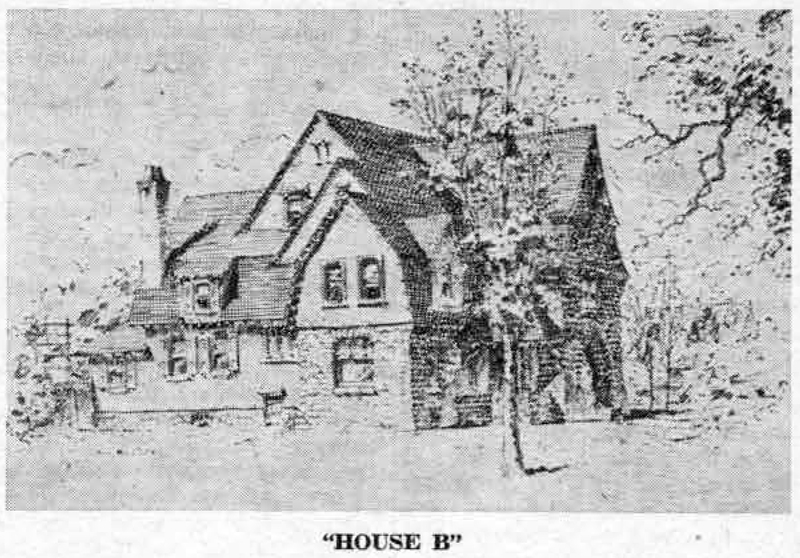 For it was in a house built from this plan that her own brood of six grew up in the 400 block on Midland avenue. Almost all of the houses on this particular block were owner-occupied. Few families moved away, and if one did, another family with children moved in. Over a period of almost 20 years, the youthful population of that block quite consistently averaged between 30 and 35. Wayne Estate houses were planned for just such large families. The design of this house incorporated “very substantial construction and roomy interior… cut stone gable in the front, in which a stone archway forms the entrance.” The first floor had “a large reception room and library, with open fireplace, same built of stone… wide hallway to the stairs… a dining room with corner cupboards for china… pantry, kitchen and out-kitchen, rear stairs and a porch at the back door.” On the second floor were “five spacious chambers, three of them communicating, all well lighted, and every one opening to the hallway. On the third floor were “two large bedrooms, two closets and a store room.” But for all seven bedrooms there was but one bath, as was the usual thing in these houses when they were built. The first office opened in the 1880’s by Wendell and Smith for the Wayne Estate was located on North Wayne avenue in a small building on the site of the southern half of the double building now occupied by the Orange Cleaners. In 1890 a second office was established when the building shown in the picture below was erected on the west side of Chamounix road, immediately to the south of the Pennsylvania Railroad tracks, near St. Davids station. Later, this building was remodeled into a home which still stands on the original site. In the 80’s and 90’s it was very advantageous to have a real estate office located as close as possible to the railroad station, since practically all prospective home buyers used that mode of transportation from Philadelphia to the suburbs. Although horse drawn vehicles were used for pleasure before the advent of automobiles, the trip by train was obviously more expedient. 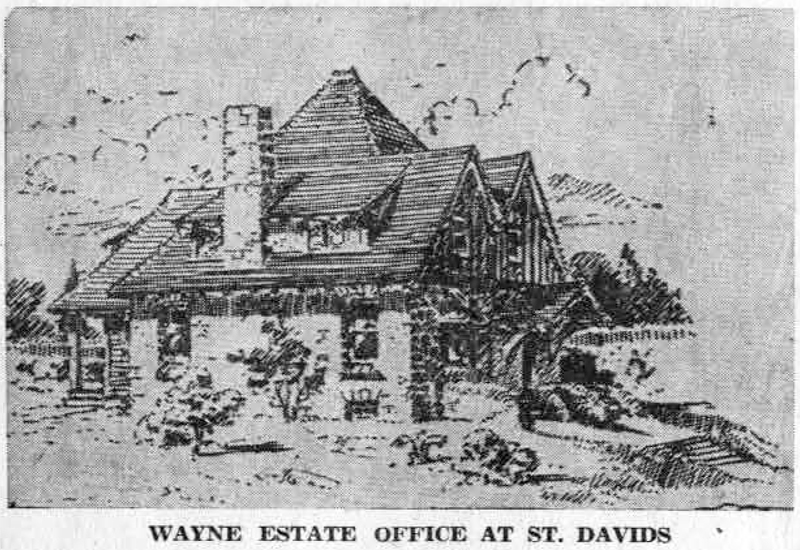 In advertising the location of their two offices, Wendell and Smith stated that they were “right at the station at both Wayne and St. Davids” and that they were open all day. On Sundays, when probably these offices were closed, the new houses that were ready for sale were always “open for inspection”. To encourage Philadelphians to make the train trip to Wayne, Wendell and Smith printed a complete time table on the back of the brochure from which these pictures are reproduced. It is rather amazing to find that more than 60 years ago there were ten morning trains and 22 afternoon trains from Philadelphia to Wayne. Reversing this order, there were 14 morning and 18 afternoon and evening trains from Wayne to Philadelphia. When this brochure was printed in 1890, many Wayne Estate houses had already been built and occupied in Wayne itself. 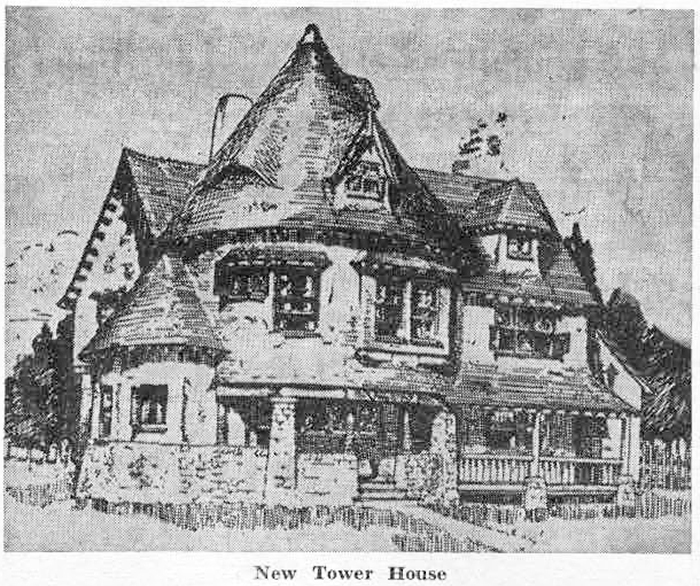 Plans were under way for a similar building operation in St. Davids, and “the south side, on Lancaster avenue near St. Davids station and the adjoining territory”, already had “half a million dollars worth of houses under way”, according to the advertisement. 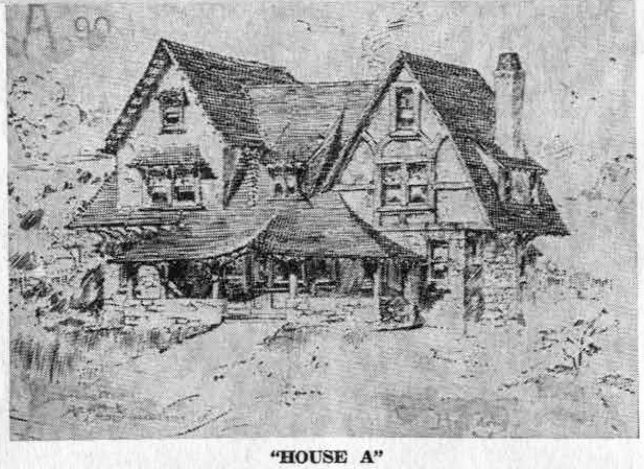 Instead of giving these house distinguishing names as had been done with those built in Wayne these St. Davids houses were to be known as “House A”, “House B”, etc. In addition to “the best of plumbing” all of them were to have “the novel goodness of steam heat… tasty decorations in stained glass and tile work and oak, and plate glass finish for first floors”. By way of special appeal to prospective buyers, the brochure states that “places of so much progressiveness should receive your attention, either for present or for future needs”. That these plans did receive much attention is very obvious, as a most casual tour of the residential streets of St. Davids will testify. F.L. and W.L. 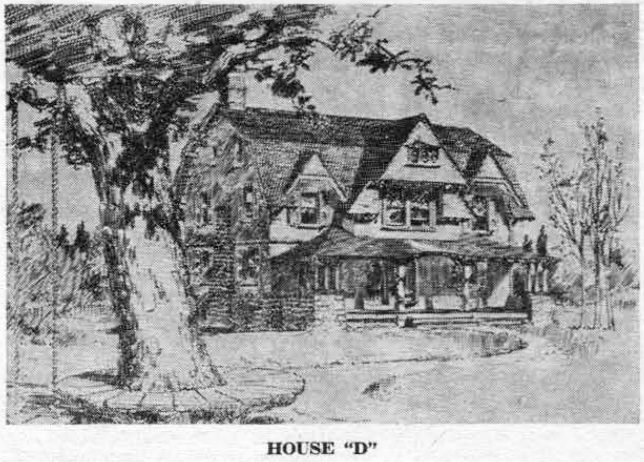 Price, of Philadelphia, were the architects for this house, as they had been for many previously built in Wayne. According to the description it had “a very picturesque exterior with a large porch across the front of the house”. The first floor consisted of “vestibule, spacious hallway, dining room, reception room, library with open grate, mantel and tile work, pantry, kitchen, out-kitchen and back staircase. Hall and stairways connected by archways for curtains”. On the second floor were “five chambers of good size, three of them across the front en suite… bathroom and nine closets”, while on the third floor were “two servants’ rooms, a large hall and store room. Very special features of this imposing house were an “open grate in lower hall and dining room removed from kitchen odors”, while the library for some intriguing reason had “a private entrance to the front staircase”. This week’s column continues by showing three additional houses that might be purchased “complete and ready for occupancy” if their sites and design suited the prospective buyers. F.L. and W.L. 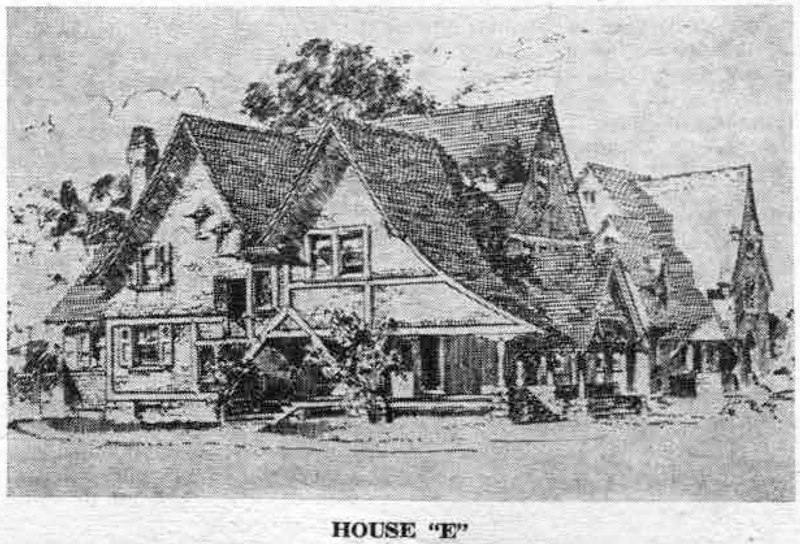 Price, of 731 Walnut street, Philadelphia were the architects of the five houses shown to date, except for the “Gabled Inn, of which J.C. Worthington, of 735 Walnut street, was the architect. The design of this house which appeared originally on Woodland avenue, was copied from “old English houses”, according to the brochure. 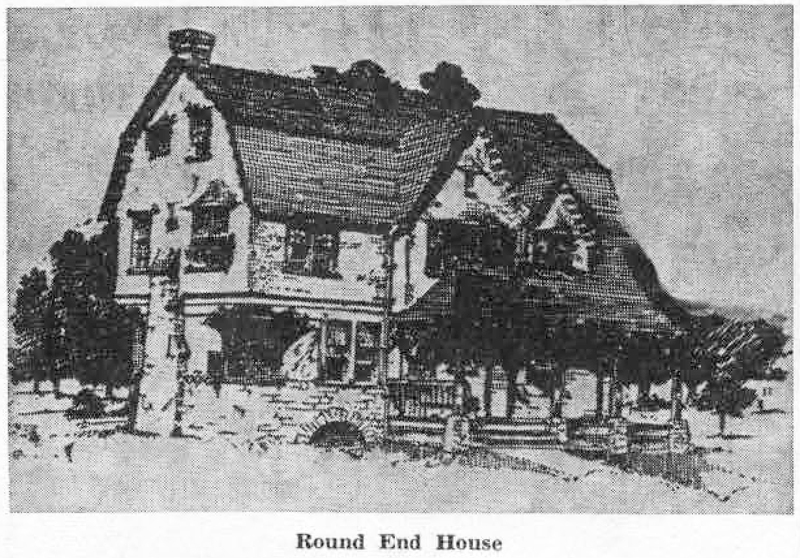 The “round end houses” were on lots 120 x 225 and sold for $8,000 each. 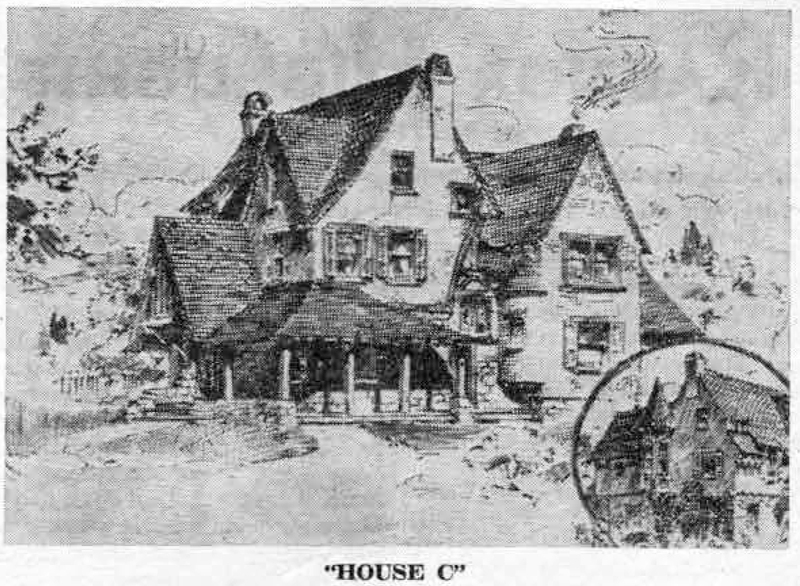 “A large, open living room with liberal fireplace, yet secluded from hall” is described as “the chief feature of this plan”. In addition it contains “seven chambers and bathroom and large store room and butler’s pantry… massive oak stairway handsomely carved… plate glass windows and effective stained glasswork… a good porch… spacious rooms… very complete house, with oak finish for the first story”. At first glance the “Pillar House”, which was originally built on Chestnut lane, bears a rather close resemblance to the “Gabled Inn”, shown in last week’s column. However it is considerably larger, having a third floor which the “Gabled Inn” does not. 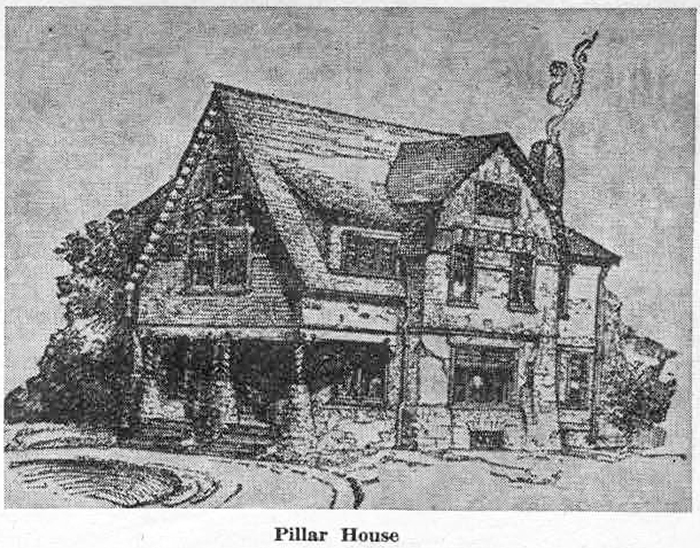 Lots for the “Pillar House” were 113 x 230, with the complete price $8,250. It was built with “stone and brick, pebble-coated to second story… large porch, vestibule, open hall, reception room, library with open grate and mantel, dining room, kitchen, out-kitchen, stationary soapstone washing tubs”. On the second floor there were five bedrooms and a bath with two rooms on the third floor.